When enabled, Auto Advance fea­ture in Light­room will auto­mat­i­cal­ly advance to the next pho­to in line. In Pho­to­shop, the Caps Lock key change your Brush tool(B) from your select­ed brush tip to a pre­cise cur­sor. This is use­ful when you want to see the pre­cise cen­ter of your brush tip. The screen­shot above was tak­en from my Mac when I had pre­vi­ous­ly dis­abled Caps Lock. 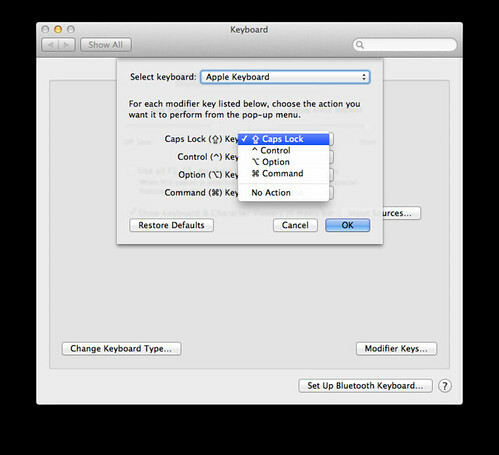 I was won­der­ing why is my Caps Lock on my key­board not func­tion­ing. It turns out that I have dis­abled it from my Sys­tem Pref­er­ences once upon a time. « Lightroom Tips: Luminance For Dramatic Skies » Are You Paying Your Photographer Enough?